It’s World Food Day on October 16th, and we list some helpful downloads below. Also, for the run-up to Advent and beyond, a reminder of a book for the season. Looking ahead, a new book for Lent and Holy Week is at the printer and should be available in a couple of weeks. And another Big Book of Liturgies is coming along shortly. Digital download: A service for all ages about not having enough to eat and about being hungry to share what we have. Includes a drawing/colouring activity. Nancy is a former Deputy Warden of Iona Abbey. 9 pages. Digital download: Graces, songs and readings relating to hunger, inequality, poverty and ‘getting our teeth into things’ in all senses. Taken from the book Blessed Be Our Table: Graces for mealtimes & reflections on food, by Neil Paynter. George MacLeod, the founder of the Iona Community, said: ‘The mark of Christian spirituality is to get one’s teeth into things … Painstaking service to humankind’s most material needs is the essence of Christian spirituality. Yet it is only the spirit in which we do things that profits anything …’ 21 pages. they call me a saint. they call me a communist. Digital download: Although this service was originally written to celebrate Harvest, it can also be used at other times of year to remind us about the importance of seeds and soil, and that hunger isn't caused by scarcity but by injustice. 11 pages. Prayers, liturgies, poems, reflections, sermons, meditations, stories and responses for groups and individuals covering the weeks from All Saints’ Day to Christmas Eve, including saints’ days, Remembrance Day, World AIDS Day and Advent. Written by Iona Community members, associates, friends and others. 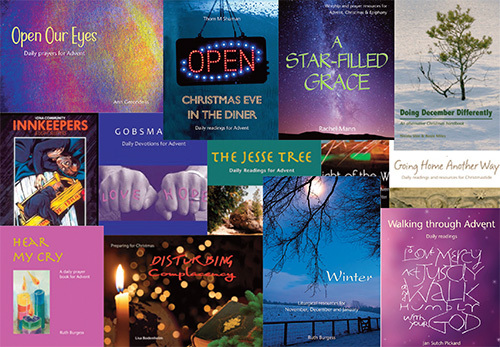 Includes liturgies for an outdoor celebration with fireworks, a Christingle service and a longest night service, as well as Advent candle ceremonies, personal prayer practices, a series of responses and blessings and a cats’ Advent calendar. A second book of simple and direct reflections for each day of the year, to help us make sense of the 'very life of life' we are living today. Tom Gordon is a former hospice chaplain, a storyteller, a member of the Iona Community and the author of several books. You are receiving this message because you opted for a subscription to this newsletter while registering on our website, making a purchase or sending an e-postcard.